Source the best local products from Southwestern PA Farms! 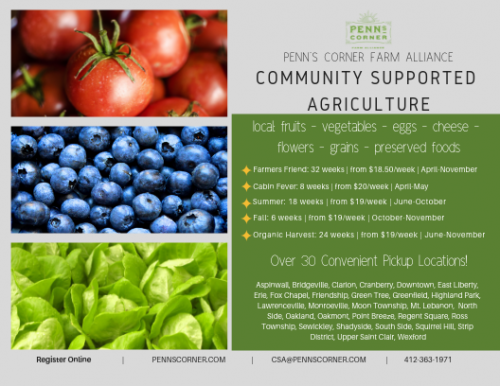 Penn's Corner Farm Alliance works with over 25 regional farms and food producers who provide locally-grown vegetables, fruit, herbs, meat, dairy and a variety of value-added products to bring a year-round supply of farm fresh food to the region. We are a farmer owned cooperative that has been providing the best of what's in season to the Pittsburgh region for almost 20 years! Consider a CSA Membership, shop our online farmstand for a la carte ordering for pickup at convenient neighborhood locations, or learn more about Wholesale Opportunities. 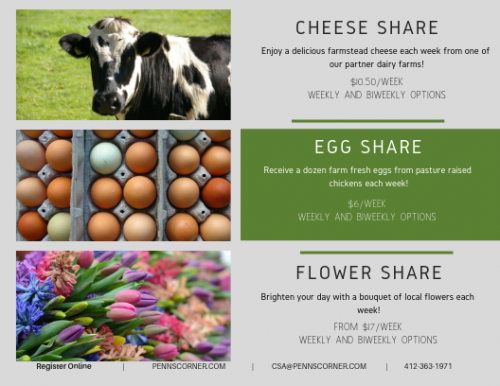 2019 CSA Shares Are Available, Sign Up Now!